Captain Cook learnt his skills first in the North Sea, sailing from the Yorkshire port of Whitby, and then in the Royal Navy on the coast of Canada. He had secret orders to explore the rumours of an unknown land in the southern oceans. 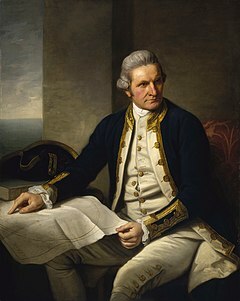 Travelling on his ship the Endeavour in 1769, he discovered New Zealand and Tasmania, mapping all the coastline he could. He also sailed along the length of Australia's eastern coast, which had never before been seen by Europeans. On 19th April 1770: Cook landed at Botany Bay, claimed it for Britain and named it New South Wales. On his second voyage in 1772, he discovered many islands in the Pacific Ocean, and he and the scientists with him gathered a vast amount of information about the area and its people. He also brought back many specimens of the the plants they found and many of the objects the natives made. He took a Harrison "sea watch" with him to help him navigate. On his third voyage, he attempted to find the North West Passage between the Atlantic and the Pacific Oceans, but was killed in a brief fight with some islanders he met after landing on a beach in Hawaii on 14th February 1779.